Placing a roof bike rack on top of your vehicle allows you to safely transport your bikes and is compatible with all cars that have roof racks installed. Compared to alternatives, roof racks have no visibility or truck access issues. The best roof bike rack is the Yakima Frontloader, which comes fully assembled from the box and has zero contact with the frame of bike for ultimate protection. Most roof mounted bike racks come with long warranties and its highly recommended to spend the little extra for the additional features. Both the Yakima and Thule bike racks are the most rated for those with expensive bikes. If you are planning a road trip and already have a rooftop cargo carrier installed, you are still able to use both at the same time with some reshuffling. However, be sure to check the weight capacity of the roof racks before adding all the weight. The majority of bicycle roof racks are designed to carry mountain and road bike wheels with a diameter of 20 to 29 inches. The width of the tire can sometimes be a issue but some brands sell an additional fat tire kit for those with fat tires. For those that already have roof racks installed, using this type of bike rack is by far the best option. Below is a list of the best roof bike racks that are lightweight and secure the bike safely without causing damage. Yakima are a reputable brand and the FrontLoader model mounts to the wheel of the bike and does not touch the frame whatsoever. When loading, the bike will remain vertical as it rolls back into position on the rack. It is a universal roof bike rack that will fit to the majority of roof racks. In terms of the bikes, there is a maximum tire width of 3 inches and it will accomdate bikes with wheels with the diameter of 20 to 29 inches. Even if you have disc brakes, thru axles and custom suspension, this is no issue for the Yakima FrontLoader. In terms of the installation, it is completely tool-free and the roof bike rack comes preassembled from the box for simplicity. Configuring the rack to work easily with your bike is easy to with adjustable arms. The Yakima FrontLoader comes with a limited lifetime warranty for peace of mind and overall, it is the best roof mounted bike rack you can buy. As you would expect, it does come at a premium but it is a worthwhile investment. The Thule ProRide is the main competitor to the Yakima and this model is their latest. It features a unique frame holder and wheel tray that automatically positions your bike when secured. Unlike the Yakima alternative, the ProRide does connect to the frame of the bike but it does so safely with thanks to a torque limiter dial where you can control the force going to the frame. On top of the torque dial, this roof bike rack uses large and soft claw pads to safely apply pressure thus reducing the risk of damage to the frame. The claws also use an extended lower jaw to increase the safety of mounting. Overall, it is the best roof bike rack that connects to your frame safely without causing any damage. As its been designed by Thule, it comes built to the highest quality and will last many years to come. The RockyMounts provide a wide variety of roof bike racks to suit different bikes. The TieRod model is a low profile, solid metal head that will fit the majority of crossbars. It is a stainless steel construction with a long throw and lockable quick release for easy loading and unloading your bikes. Unlike the Tomahawk model below, it is only suited to wheel tires of 2.7 inches but it will be compatible with disc and standard brake systems. You are also able to choose a range of colors that include black, blue and silver. The best part about the RockyMounts TieRod is the affordability as its almost half the price of the Thule and Yakima alternatives. It is by far the best roof bike rack for the money but not suitable for fat tires but the Tomahawk model below is ideal for this. The Upright Mount Tomahawk by RockMounts is suited to fat bikes with tires as wide as 5 inches. It is more expensive that the alternatives but when you have to factor in buying an adapter to fit tires larger than 3 inches, it is still a cost effective way of transporting your mountain bike. RockyMounts have also designed this Tomahawk model to have zero contact with the frame. Instead, it hooks over the front wheel with a ratchet and the wheels are held down by wheel straps. This roof bike rack will work with 99% of roof racks from round, square, factory, aero and others. As with the majority of roof mounted bike racks, there is a wheel diameter limit of 20 to 29 inches, which is perfect for the majority of bikes. Overall, it is the best roof mounted bike rack for fat bikes without the need of purchasing an extra adapter, which can be fairly expensive. If you are looking for a cheap roof bike rack, then the CyclingDeal is the one to go for. Unlike many of the cheap alternatives, this uses a steel powder coated construction with a lockable feature to ensure the bike is firmly secure whilst driving. It is compatible with tires as wide as 3 inches and uses an upright mount to connect to the frame. 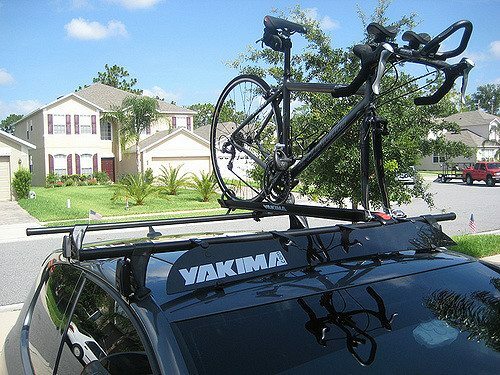 If you are using a cheap roof mounted bike rack, you are probably not bothered with the risk of frame damage but if you are, we highly recommend looking at the Yakima or Thule alternatives. Overall, it is an affordable roof bike rack that will do the job in hand securely and will save you money. There may be slight bike wobble whilst driving but the locks and tie down straps will completely secure the bike to the rack. 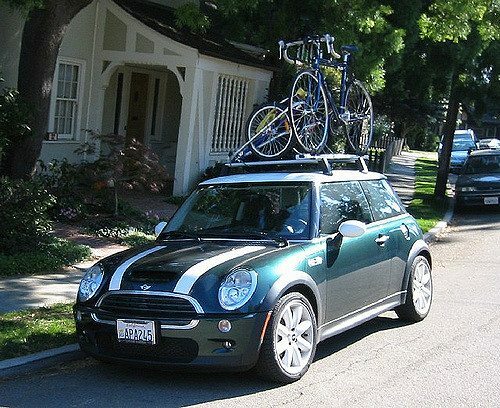 If you have already installed a roof rack system to your car, attaching a roof bike rack is fairly straight forward. The majority simply click straight onto the rack with no issues and takes a matter of seconds. The best thing about this particular type of bike rack is that its the cheapest compared to the trunk bike rack and hitch bike rack alternatives. There are some factors that you have to consider before jumping straight at the first roof bike rack you find. Below is an in-depth buying guide that should help you with your purchasing decision. Most roof mounted bike racks will be suitable for the standard bikes but not everyone has a “standard” bike and many will have a wider tire width. Bikes such as “Fat Bikes” can have tires that span at least 5 inches wide, which can be a problem. There are some roof bike racks that specialize in wide tires such as the RockyMounts Tomahawk but Thule and Yakima do offer adapters for this. The only issue is that you will have to pay a premium and the overall cost of the roof bike rack can be very expensive. People that own expensive bikes will be very cautious when it comes to choosing which roof bike rack. The main thing you should look out for is whether or not the rack secures the bike via the frame as this has the potential to cause damage if it does. The Yakima and RockyMounts Tomahawk both have zero contact with the frame but the Thule alternative does have many features that make the risk very minimal. Removing the front wheel is required for a fork mounted bike roof rack but for many people, this may not be ideal. Having to dismantle your wheel every time you are transporting your bike can be a pain and especially if you are not that good with tools. However, that being said it is more stable than a wheel/frame holding alternative and usually much cheaper. The RockyMounts TieRod is an example of the cheapness but if you rather not take the wheel off, sticking with the standard roof mounted bike rack is just as good but of course, more expensive. The main disadvantage of the roof mounted bike rack is the fact that you need to lift your bike on top of your roof. If you have a heavy bike, this is quite a struggle and its critical that loading the bike onto the rack is as simply as it can be. This means no silly locks or awkward features that you have to tackle whilst holding your bike on top of the roof. Many roof bike racks have cleverly designed frame holders and wheel trays that make your bike simply position itself automatically. This is a featureof the Thule ProRider and it makes loading and removal of the bikes from the rack much easier. Roof racks aren’t as popular as the alternatives as they are more difficult to use, produce height restriction issues and has the potential to reduce fuel economy by causing additional drag. However, you do not have any trunk access or issues with reverse parking as you have clear visibility and they are much cheaper. Sticking with the premium brands such as Yakima and Thule will be the best investment but not everyone will want to spend the extra for the reputable branding. Mid range is the RockyMounts, which are gaining popularity around the world and for good reason with excellent value for money and good built quality.